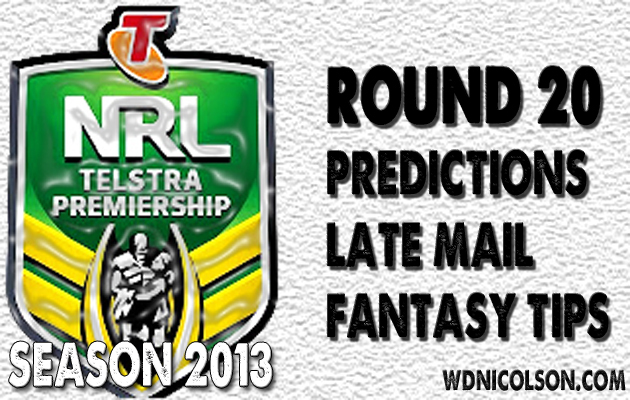 For our analysis of Tuesday team selections for Round 20 - click here. The Postman has his NRL Dream Team Picks on nrl.com as of Thursday and they pretty much apply to NRL Super Coach as well. A few more notes are below though. Voting Allocation for Round 20 of the NRL is below. Loser is completely done and dusted in the playoff race... the winner is still probably dusted in the playoff race. Can't see the Brocnos making a run at all - truth be told how Prince was spared the axe when Wallace and Norman got it is BEYOND ANYONE bar Coach Griffin - but the Cowboys have JT and Bowen so maybe they could keep North Queensland's head above water for another week or two at least... So Cowboys by 2 points. COWBOYS: It looks like Morgan is the new preferred #7, so don't expect Lui to be a late addition. That bench could really do with Bolton and Taumalolo but the fact they are named as 18th and 19th men suggests Thorby and Sims get the call. LATE UPDATE? Thompson starts at 9, Mitchell to bench. Bolton and Taumalolo miss out. LATE UPDATE? Hannant gorn! Dodds starts at prop. Lui onto bench. Canterbury are coming off a 39-0 bending over of the Storm... Parra couldn't score a point against Canberra in a game where the Raiders were deadset ordinary. Josh Morris could make Ryan Morgan look like... Ryan Morgan. That matchup is just one of many that scream 'Pick Canterbury' and unless Jarryd Hayne makes a late appearance - picking the Bulldogs by 22 points seems unders. BULLDOGS: Healthy looking team - hard to find a reason anyone gets replaced, especially after a week off to rest up for the likes of Kasiano and Pritchard who missed the Storm game. LATE UPDATE? Jackson starts, Williams to bench. 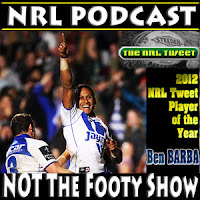 EELS: Does Hayne play? Right now - let's go with sure. But for those Fantasy players the fact this game is Friday night means you have an hour after 6:30pm Friday to know for sure. Hard to imagine Sandow gets a reprieve but Ryan might at the expense of Junior Paulo. LATE UPDATE? No Hayne. Maitua to bench, Joseph Paulo starts. Last 15 games: Canberra, Canberra, Canberra, Canberra, Canberra, Canberra, Dragons... Canberra, Canberra, Canberra, Canberra, Canberra, Canberra, Canberra and Canberra. Thus Dugan or no Dugan - Raiders by 6 points. Note I could have said Canberra that last time as well, but changed it up for St George Illawarra fans... how considerate right? DRAGONS: Price won't change a winning team - meaning Stockwell comes in on the bench and the shuffle covers for the loss of Cooper. LATE UPDATE? Frizell starts, Merrin to the bench. RAIDERS: Blake Ferguson is almost a certainty - he'd go to the centres, Thompson to the second row, Edwards to the bench and Kennedy would miss out. Wighton is another week away. LATE UPDATE? Sounds like Ferguson is playing NSW Cup not NRL. Thus Thompson stays in the centres but Earl returns for Sauiluma on the wing. Gold Coast are somewhat of a hope here... and they've actually got the Dragons to thank. Getting Myles and Bird back is big (Zillman returning would be handy as well) but will the Bunnies start to doubt themselves if a team takes it to them physically like Saints did on Monday? Don't get me wrong - South Sydney's failure to put the Dragons away when they led 18-6 was why they lost (the Dragons off the back of Trent Merrin suddenly played some footy with 20 minutes to go was also a factor) but Souths just didn't strike me as a team that had that burning desire they'd shown for much of the season. Same happened against Cronulla earlier this season... so if they doubt themselves - the Titans are right in this. But there's no way I'm picking the Gold Coast, so Rabbitohs by 10 points. TITANS: Myles and Bird will play. Zillman is a question mark but the home game helps his chances. Takairangi is also likely to play, while don't rule out O'Dwyer starting in the centres for Dowling. LATE UPDATE? No Zillman, Are 1-17. RABBITOHS: No Inglis yet. Watch out for a sneaky Matt King selection with Andrew Everingham missing out after some indifferent form, allowing Bryson Goodwin to move back to the wing. Michael Maguire may also ring a shock forward selection change or three as well - he likes to keep his players on their toes. LATE UPDATE? Hunt looks like the casualty for King, while those forward changes could be significant. Everingham and Hunt out, Merritt to FB, King and Farrell new wingers. George and Sam Burgess start at prop, Tyrell and Peats out. Tom Burgess and Keary onto bench. Lowe starts at lock, Asotasi to the bench. WARRIORS: Packer could come in for Matagi but that is a bit harsh given how good the kid played last week. LATE UPDATE? Lillyman starts, Matulino to the bench. STORM: Rested up and ready to go. LATE UPDATE? Ryles comes in and McLean misses out. Both teams turned me off deluxe with bad performances last weekend... that is Cronulla never had the ball or enough good players to beat the Roosters (were crushed 40-0) and Penrith got a ridiculous TRY call early then stopped playing smart footy, allowing the Knights to bust holes in them thereafter (Newcastle won 32-14). That loss saw Penrith drop out of the Top 8 and should they lose here - possibly for good. Sharks have personnel issues but still have Todd Carney and enough workers up front to be favourites at 'The Tip'. Sharks by 4 points. SHARKS: Lewis, Gallen, Tupou and Ryan are probably week away, while Pomeroy looks set to keep Mills out of the side. Graham is the biggest doubt, while Robson should play. Is Carney carrying a sternum injury? PANTHERS: Manu will return, while Naiqama will play NSW Cup given Brown is named in the centres. Docker's face isn't healthy but may yet play... then again the Panthers named Tighe last week as well. Newcastle - how about proving you are a good team... against a very very good one. The Knights have three wins in a row... impressive right? Not quite as jaw-dropping when you see it was the Panthers, Bulldogs and Titans... The Roosters roasted the Sharks 40-0, the Dragons by 36pts and did the business against Manly the week before that. Easts have earned the right to be tipped against anyone on the road bar Melbourne and Souths - so Roosters by 14 points. KNIGHTS: Sims or Tetevano for the bench looks to be the only question. LATE UPDATE? Tetevano is preferred to Sims on the bench. ROOSTERS: SBW will play, so Liu misses out. Jennings and Maloney left the field late in last week's win but Jennings is the only one with a slight leg injury. He should play as well. LATE UPDATE? Liu preferred to Guerra on the bench. The Tigers saw their season end last week against the Warriors... despite leading 14-6 at halftime their ball control in the 2nd half in attacking situations was abysmal and Benji Marshall's last touch at Leichhardt was a knock-on - not exactly fairytale stuff. Manly have beaten three inferior opponents in back to back to back weeks by a combined 78 points... and Aaron Woods is out. Look Robbie Farah might keep the Tigers in it - but Manly win by at least 8 points. TIGERS: Keith Galloway back? Watch this space as he was due back last week. He would replace Spence. LATE UPDATE? Galloway back, Spence omitted. Anasta to half, Sironen to bench. SEA EAGLES: Matai's hip forced him off against the Titans but he wanted to come back on - a good sign he'll play with a 8 day gap between games. Rose is likely as well given the extra time to recover from an ankle injury. LATE UPDATE? Gower in, Hasson out. What are your tips for Round 20? Are you taking any advice from our Awesome Foursome panel this year? You should be from Jakey Jake and the Funky Bunch.